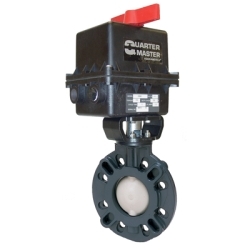 4" Type 57 Butterfly Valve with Series 94 Electric Actuator | U.S. Plastic Corp. The Series 94 actuator is a basic electric actuator designed for up to 4" quarter-turn butterfly valves, and is a good low-cost alternative to larger electric actuators.